Four OCBC Troop 881 girls earn highest honor. 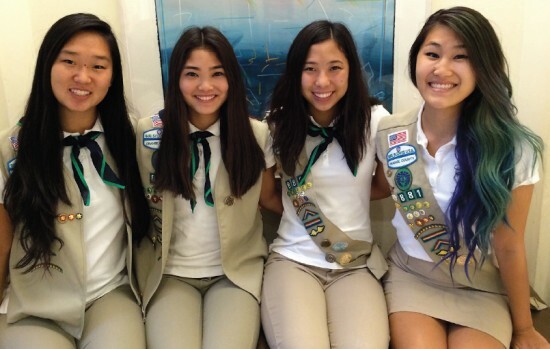 OCBC Girl Scout Troop 881 Gold Award recipients (from left) Ashley Masuda, Samantha Hirata, Jillian Kido, Traci Ishii. ANAHEIM — Samantha Hirata, Traci Ishii, Jillian Kido and Ashley Masuda are recent recipients of the coveted Girl Scout Gold Award as members of the Orange County Buddhist Church (OCBC) Girl Scout Troop 881. The scouts were honored on May 29 at the year-end ceremony held at OCBC. The Girl Scout Gold Award represents the highest achievements in Girl Scouting. This prestigious award requires a completion of two Girl Scout journeys, earning the Silver Award, and planning an individual community service project. This project must provide a sustainable and lasting benefit to the community. A minimum of 80 hours is required to complete the steps to the Gold Award. Samantha Tamiko Hirata, daughter of Clyde and Chris Hirata, attended Fountain Valley High School in Fountain Valley. She started in Girl Scouts as a Daisy, achieved the Bronze and Silver awards and also received the Presidential Volunteer Service Award. For her Gold Award project, Samantha worked with Knots of Love, a non-profit organization that collects knitted or crocheted caps and gives them to chemotherapy patients all over the country. For her project, Samantha recruited family members, relatives, friends, and also worked with senior citizen groups to make knitted caps. She also raised money through cookie drives that were donated to the organization. Samantha plans to attend San Francisco State University and major in business administration in the fall. Traci Kim Ishii, daughter of Steve and Joanne Ishii, attended Valencia High in Placentia. She started in Girl Scouts as a Daisy and earned the Bronze and Silver awards and Presidential Volunteer Service Award. For her Gold Award, Traci promoted a “Go Green Initiative” project that involved the installation of a water hydration refilling station at Orange County Buddhist Church. The hydration station addressed an environmental concern: studies have shown that 80% of empty plastic drinking water bottles end up as “litter” in the U.S. Every time someone uses the refilling station to fill a reusable container, a plastic bottle is eliminated. Traci also developed a Go Green education and awareness campaign at OCBC that consisted of designing a “Let’s Go Green” reusable water bottle, education class for youth groups, and presentations to the general OCBC congregation. Traci plans to attend Long Beach State University and major in pre-kinesiology in the fall. Jillian Akemi Kido, daughter of Rod and Rose Kido, attended Irvine High School in Irvine. She started in Girl Scouts as a Daisy and also earned the Bronze Award. For her Gold Award project, Jillian created an instructional gymnastics video for children that have special needs like Down syndrome and cerebral palsy. Because many children with special needs may not be presented with the opportunity to try gymnastics or may not be able to afford it, she wanted to address this problem and make people aware of the importance of exercise for all. Jillian also created a video that is inexpensive and readily available to people online. The video was developed in close collaboration with the United Cerebral Palsy organization. Jillian will be attending UC Davis this fall semester and will be majoring in economics. Ashley Keiko Masuda, daughter of Craig and Carolyn Masuda, attended Fountain Valley High School. She started in Girl Scouts as a Brownie, achieved the Bronze and Silver awards and also received the Presidential Volunteer Service Award. For her Gold Award project, Ashley organized an awareness fair at Cerritos Baptist Church. The objective was to teach children about the importance of community service as well as making them aware of some of the important issues going on in the world. The project encompassed several different activities, such as a craft projects, interactive games, and preparing boxes of food for distribution to the needy. Ashley will be attending UC Irvine in the fall as an undeclared major. She hopes to study in abroad in Japan at some point during her collegiate career. Thank you to Rafu Shimpo for printing this nice story and Congratulations to Ashley, Samantha, Jillian, and Traci on attaining your awards. You are continuing the outstanding level of achievement of both Boy Scout Troop 578 and Girl Scout Troop 881 out of the Orange County Buddhist Church, Anaheim, California. Thank you for your service in the community and best wishes on your college careers!